In February 2014 an outbreak of the Ebola virus was identified in the south-eastern forests of Guinea, the first time the virus had been recorded in the West African state. By March, it had spread from Macenta, Gueckedou and Kissidougou to the capital Conakry. By April, cases had been confirmed in a further two districts ? Dabola and Djingaraye ? and in neighbouring Liberia. The disease has since advanced to the capitals of Guinea, Sierra Leone and Liberia, and it has killed two doctors, Dr Samuel Brisbane from Liberia and a Ugandan, with two more being seriously ill.
Now Nigerian officials are racing to prevent an outbreak in Africa?s largest city after a Liberian man died in Lagos shortly after arriving at the airport last Tuesday. All its entry points were put on red alert. M?dicins sans Fronti?res has called this outbreak ? the world?s largest recorded to date ? ?unprecedented?, due to its broad geographic spread. The World Health Organization (WHO) have recorded 1,201 cases attributed to the Ebola virus up to last week, including 672 deaths. The Ebola virus is named after the Ebola River in the Democratic Republic of Congo, where the disease claimed its first known victims in 1976. A separate strain broke out simultaneously in Nzara, Sudan. Ebola is a ribonucleic acid (RNA) virus and multiplies particularly rapidly in its host creating a high pathogen dose. The science writer David Quammen, who has investigated the origins and spread of the virus, writes that ? [RNA viruses] produce acute infections, severe for a short time and then gone. Either they soon disappear or they kill you.? In the process, ?sneezing, or coughing or vomiting or bleeding or diarrhoea ? facilitates transmission to other victims?. There are five known species of Ebola virus: Bundibugyo ebolavirus; Zaire ebolavirus; Reston ebolavirus; Sudan ebolavirus; and Ta? Forest ebolavirus. All but the Reston strain can be fatal to humans and all but the Reston strain are found in Africa. 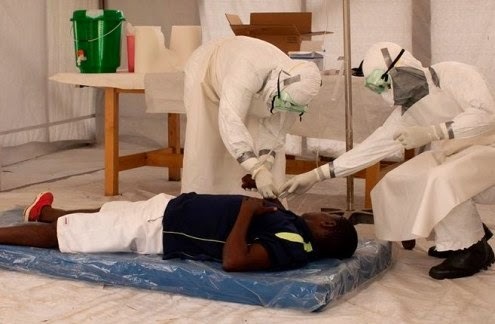 Until recently, the Zaire strain of Ebola was thought to be behind the current outbreak, with the US Centres for Disease Control (CDC) noting a 98% match between the West African and Zaire strains. The Zaire strain of Ebola is the most deadly: it attacks all organs in the body, including the skin, and can have a fatality rate of up to 90%. Since its first appearance ? and excluding the current outbreak in West Africa ? the strain has killed 1,098 of the 1,388 people it has infected, an average case fatality rate of 79%. However, a team of experts studying the West African strain reported in the New England Journal of Medicine recently that the Guinea outbreak is a new strain of the virus: though closely related to Zaire ebolavirus, the current strain is endemic to West Africa and developed parallel to the central African ebolavirus strain. According to the team?s investigation, the strain?s outbreak can be traced to the death of a two-year-old child in Gueckedou on December 6 last year. Ebola is thought to be a zoonotic or animal-borne virus. The virus survives in a ?reservoir? host ? an animal or insect that carries the virus at no cost to itself ? and is passed on to other animals or humans through contact with the bodily fluids, secretions or organs of the host animal. Though it has not been conclusively proved, the fruit bat (Pteropodidae) is considered to be the natural host or ?reservoir? of the ebola virus. The exact manner in which Ebola enters human cells remains a mystery. Transmission to humans and primates is thought to occur through direct contact with the animal host, or through contact or consumption of the meat, bodily fluids or secretions of animals that have become infected by contact with the host. Guinea is a known wildlife trafficking hub and last month, the country?s government issued a warning to citizens to avoid eating traditional bushmeat dishes. Once it has presented in humans, Ebola is transmitted through direct contact, where broken skin or mucous membranes come into contact with the blood or secretions of the infected person. It may also be transmitted indirectly ?through exposure to objects (such as needles) that have been contaminated with infected secretions?, according to the US Centres for Disease Control and Prevention. This means that healthcare workers and family and friends of those infected with the virus are at a higher risk of infection. The Ebola virus causes a viral haemorrhagic fever, a set of severe illnesses that are ?multisystem? in that they affect various of the body?s regulatory systems. These viral diseases damage the circulatory system and may be accompanied by bleeding or haemorrhaging. 10. Patients present with fever, weakness, muscular pain, headaches and sore throat. The generality of the symptoms at this stage makes it difficult to distinguish Ebola from various other diseases, including malaria, typhoid fever, meningitis or cholera. There is no vaccine or cure for the Ebola virus, though several vaccinations are currently being tested. According to the US CDC, treatment is thus limited and merely supportive of the body?s immune function: providing fluids, electrolytes and oxygen; keeping blood pressure constant; and treating additional infections with antibiotics. It is unclear why some people infected with the virus survive where so many do not, but it is thought to relate to the strength of the individual?s immune system, the strain of the virus and the viral dose the person has been exposed to.